Happy Holidays to my Blog followers and Women Seen and Heard Facebook friends! As you know, this has been a time when society is waking up to the power of women’s voices. The #METOO and #TIMESUP phenomena highlighted sexist challenges that women face in the workplace and gathered millions of followers. When women have the courage to “speak truth to power” in numbers too large to ignore, they can have a stunning impact that will impact the workplace culture and women’s lives overall. The Brett Kavanaugh hearings included sworn testimony by Dr. Christine Ford about the nominee’s character. Her sworn testimony galvanized a nation, leading to unrest upon his confirmation, widening the political polarization that has been brewing for years. Young women were taught to believe that what they say will be taken seriously and that they will be judged on merit, allowing them to advance into leadership positions without obstacles. They may well now think twice. Never before did the country have so many converging wake-up calls regarding women’s status (see my blog post, The Credible Presenter: Being Heard Versus Being Believed, to learn more). So much has happened to advance women’s voices, pushing both established and young emerging leaders towards the microphone, that I felt a calling to analyze and comment on their presentations. I did so in periodic blog posts about public communication. My goal was always intended to give women speakers ideas for how to feel more confident when informing, persuading, and inspiring others. Remember that old joke, “How did you get to Carnegie Hall?” The answer is “Practice, practice, and more practice!” It’s not rocket science. Reticence and anxiety decreases and mastery occurs the more you practice your speaking skills. You learn from the feedback you get from others, whether you solicit it or you read non-verbal cues. The audience’s reaction is feedback for what went well or didn’t. When people support your proposal (campaign, or policy), you can see that your presentation made an impact. The next time you have a chance to weigh in at a meeting, take the mic! From the U.S. Capitol dome to statehouses across the country, women affirmed a confident slogan on a trendy T-shirt: “The Future is Female.” Voters sent a historic 100-plus women to Congress, including at least 98 women to the House, an all-time high, and a dozen females to the U.S. Senate. The Washington Post notes that ‘It’s a sea change:’ Winners include a CIA agent, nuclear engineer, and a flight attendant. I so appreciate your interest in the blog posts that emerged from WOMEN SEEN AND HEARD (Lois Phillips & Anita Perez Ferguson, 2004). 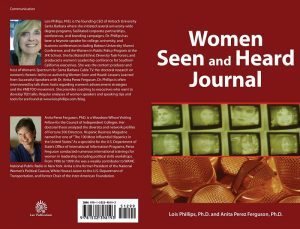 Building on what we learned, Anita Perez Ferguson and I have just published WOMEN SEEN AND HEARD SPEAKER’S JOURNAL: Workbook & Templates. The Templates allow readers to easily organize their unique content for any type of presentation they might deliver, from the Briefing to the Pitch, the Humorous presentation, the “Small Wins” Briefing, and even the Wedding Toast! Given how busy women are today, these templates will save time and force focus. Many blog readers enjoyed WOMEN SEEN AND HEARD: LESSONS LEARNED FROM SUCCESSFUL SPEAKERS (2004, Luz Publications), which is also being refreshed in a 2nd edition. Stay tuned for our announcement of how to order a copy of the new JOURNAL. Freedom of speech is a right, so I hope you take advantage of it in your sector, whether business, education, government, or politics. In the meantime, may you enjoy good health, life, liberty and the pursuit of happiness in the coming year! Lois Phillips is a dynamic public speaker whose clients say she “practices what she teaches.” Her academic background combines with executive experience to inform her training and coaching. Using principles gained from interviews with successful speakers and outlined in “Women Seen and Heard: Lessons Learned from Successful Speakers”she provides coaching and training to spokespersons, managers and executives. Dr. Phillips has a special interest in executive and professional development, strategic planning, and Board leadership. She has produced conferences on women’s leadership, moderated two television programs about the changing roles of women and men, and has delivered numerous keynote conference presentations. For many years she presented workshops to corporations on the subject of PREVENTING SEXUAL HARASSMENT IN THE WORKPLACE after providing climate surveys of the corporate culture.